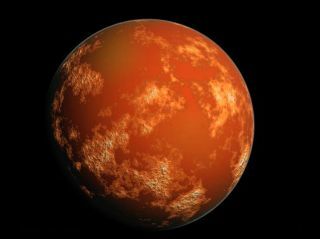 An illustration envisions Mars, as presented during the unveiling of the proposed Mars flyby mission on Feb. 27, 2013. A private group's ambitious plan to launch a manned mission to Mars five years from now is just the latest entry in a burgeoning field — the non-governmental exploration of deep space. The nonprofit Inspiration Mars Foundation announced today (Feb. 27) that it aims to launch two people on a 501-day Mars flyby mission in January 2018. The main goals are to generate excitement about space travel and test out technologies that will be needed to put boots on Mars in the future, officials said. The mission would combine a commercial space capsule and inflatable module into a single spacecraft that will carry a man and a woman, possibly a married couple, to Mars and back. Astronauts have not set foot on the moon in more than 40 years, and a company called Golden Spike wants to change that. Golden Spike, which was named after the final spike pounded into the United States' First Transcontinental Railroad in 1869, plans to start flying roundtrip missions to the moon by 2020. The company will charge $1.5 billion for each mission, which will land two astronauts on the lunar surface and return them safely to Earth. Two other companies aim to send customers on slingshot journeys around the moon, without touching down on Earth's nearest neighbor. Virginia-based Space Adventures and Excalibur Almaz, a firm headquartered in the Isle of Man, plan to charge $150 million per seat. Space Adventures will use souped-up Russian Soyuz spacecraft, while Excalibur Almaz will adapt Soviet-era Almaz space stations for the journey. Other companies are interested in mining and utilizing the moon's resources. The Texas-based Shackleton Energy Company, for example, aims to transform lunar water ice into rocket fuel, then sell it from off-Earth "gas stations" by 2020 or so. While Shackleton's mining bases and off-Earth fuel depots would be primarily robotic, some astronauts would be needed to oversee operations. But a number of other private moon-exploration efforts are entirely unmanned. At present, 23 teams are racing to win the $30 million Google Lunar X Prize, an international challenge to land a robot on the lunar surface, have it travel at least 1,650 feet (500 meters) and send data and images back to Earth. Many of the Google Lunar X Prize teams have ambitions beyond merely winning some cash. Prominent team Moon Express, for example, also aims to extract water and other resources from Earth's natural satellite. The moon isn't the only target for deep-space miners. In the last year, two firms have announced their intentions to extract resources from near-Earth asteroids. Both Planetary Resources — which counts Google execs Larry Page and Eric Schmidt among its financial backers — and Deep Space Industries want to mine asteroids for water and metals. Like Shackleton, they think accessing space-based resources will make further exploration easier and cheaper, helping humanity extend its footprint out into the solar system. The two companies plan to launch their first scouting spacecraft in the next year or two. Another organization is looking at asteroids, too, but with more of an eye toward the threat they pose to Earth. The nonprofit B612 Foundation plans to launch an infrared space telescope called Sentinel to a Venus-like orbit in 2018, to help identify and map the orbits of near-Earth asteroids. Sentinel aims to help humanity spot the most dangerous space rocks with enough lead time to mount a deflection mission if necessary. Such work is sorely needed, many scientists say, pointing to the surprise Feb. 15 Russian meteor explosion as a cautionary tale. Indeed, just 9,700 of the millions of near-Earth asteroids thought to exist have been identified to date. In 5 1/2 years of operation, Sentinel should map the orbits of 500,000 near-Earth asteroids, including many of the biggest and most dangerous ones, B612 officials say. The estimated $450 million cost will be paid for with privately raised funds. Inspiration Mars has no plans to touch down on the Red Planet, but another nonprofit group does. The Netherlands-based Mars One aims to land four people on the Red Planet in 2023, as the vanguard of a Martian colony that will grow with new arrivals every two years thereafter. There are no plans to return any of these pioneers to Earth. Mars One estimates that getting four humans to Mars by 2023 will cost about $6 billion. The organization plans to stage a global reality-TV event around the mission, with cameras following every step of the way from astronaut selection to the settlers' first years on the Red Planet. Revenues from broadcasting rights and sponsorships should cover most of the cost, officials say. The founder and CEO of the private spaceflight firm SpaceX also is eyeing a Mars colony in the not-too-distant future. Elon Musk has said he wants to help establish a Red Planet settlement of up to 80,000 people, by ferrying folks there for perhaps $500,000 per seat. The colonists would not travel in SpaceX's Dragon capsule, Musk has said, though the company has been working with NASA on a possible "Red Dragon" mission that would send the vehicle to Mars to do unmanned science work. While SpaceX's Mars plans are a bit nebulous at the moment, there's little reason to doubt Musk's sincerity or seriousness. SpaceX is developing a huge reusable rocket that could get colonists to the Red Planet, and Musk has said on multiple occasions that he started SpaceX primarily to help humanity become a multiplanet species. NASA, of course, has ambitions of its own when it comes to deep-space exploration. It's working to get astronauts to a near-Earth asteroid by 2025, then on to the vicinity of Mars by the mid-2030s. But the agency has no desire to monopolize efforts beyond low-Earth orbit. For example, NASA officials voiced enthusiasm about Inspiration Mars' mission and indicated a desire to help make it happen. "It's a testament to the audacity of America's commercial aerospace industry and the adventurous spirit of America's citizen-explorers," NASA spokesman David Steitz said in a statement. "NASA will continue discussions with Inspiration Mars to see how the agency might collaborate on mutually beneficial activities that could complement NASA's human spaceflight, space technology and Mars exploration plans."